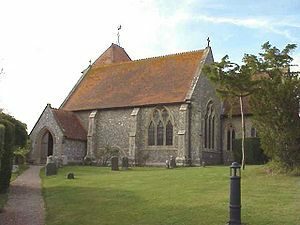 St Mary’ church in Aldworth dates back in part to around 1200. 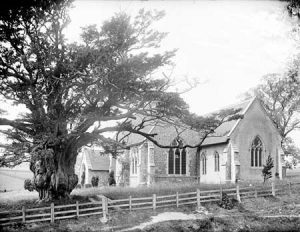 The Yew tree in the churchyard is at least 1000 years old and though it has been struck by lightning and blown over in a storm it is still partly alive. The oldest part of Aldworth Church is the lower half of the tower, which is in the style known as Transitional Norman and may be dated about the year 1200, but the site is probably much older. The original circular shape of the churchyard suggests an earlier pagan burying ground which can still be seen by a ring of holly trees to the east of the church. The church yard was extended to the beech hedge in the 1930s. A mile to the south-west a complete Pottery kiln of Roman date was found which is now in the Science Museum at South Kensington. Two miles to the north-west is the site of the Iron Age camp of Lowbury and just north of the village along the crest of the Downs runs the Ridgeway, perhaps the oldest road in England. The late Colonel Burn in his book The Battlefields of England gives convincing reasons for placing the site of King Alfred’s victory of Ashdown over the Danes, in 871, on the Ridgeway at the meeting of tracks known as Guidepost. In the 13th century the Manor was held by the Norman family of de la Beche (after a French place name). The nine stone effigies of this family all date from the half century 1300-1350 and are unique in the country. No other parish church possesses anything like them, even in their damaged condition, and to find them in a tiny village is remarkable. The Reverend F. Llewelyn Lloyd, vicar from 1859 to 1888, gave much thought to identifying the effigies from documents of the age and his conclusions may be taken as the most probable. The nine effigies represent five generations of the family. 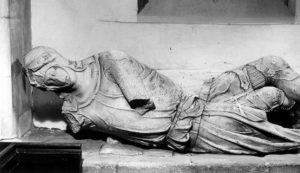 The splendid figure lying on its side is Sir Philip de la Beche, valet to King Edward II. If he really was as big as that he was indeed a giant! The statues are popularly known as the “Aldworth Giants”. It is possible that the dwarf is deliberately put at his feet to emphasise the contrast. The other eight are those of his grandfather, father, wife, three sons, Lady Isabella, wife of his eldest son Sir John, and a son of these two who died young. Lord Nicholas, in the centre, was a leading figure of the early years of Edward III, Seneschal of Gascony, Constable to the Tower of London, and custodian of the Black Prince as a child. It is presumed that he and Lady Isabella built the south aisle about the year 1340, turning the south wall into an arcade. The south aisle is a little wider than the nave, an unusual feature. Soon after, the male line became extinct, but the family held the Manor in the female line of Langford for another 150 years. Three of the bench ends under the tower date from this time. The seal of Lady Isabella was picked up near the Manor house in the year 1871. It is a beautiful piece of silver-work and the finest example of its kind in the country. In 1968 the vicar and churchwardens sold the seal to Reading Museum, where it is now on view. In 1644, an officer of King Charles I, Colonel Symonds, visited the Church and made notes and drawings which still exist. From him we know that the three heads now missing were intact at that date. We also have a record in the registers that in 1659 the curate, Thomas Longland, resigned because he would not tolerate the sacrilege and wickedness of the people, so we presume the damage was done deliberately at that time. It is also known from Colonel Symonds that Queen Elizabeth I came to see the effigies in company with the Earl of Leicester. She probably rode over from Ewelme. He also tells us that the village people of that time had come to speak of four of the effigies as “John Long, John Strong, John Ever Afraid and John Never Afraid”. (John Ever Afraid, a tenth effigy formerly under the arch on the outside of the south wall, has since disappeared). For more information on the effigies click here. The Jacobean pulpit was once in St Lawrence’s Church, Reading. For some reason it was no longer wanted there and was sold or given to Aldworth about the year 1740. The reading desk is also a splendid piece of carving, but its history is not known. It hardly looks as if it was originally intended for a church. From 1744 to 1748 the incumbent was Richard Graves, a writer of religious books of some note in his day. He married Lucy, daughter of Edward and Mary Bartholomew of Dumworth Farm, whose tombstone can be seen near the main church door. We now come to the 19th century and Lord Tennyson’s connection with the village. In 1850 he married Emily Sellwood whose family home was at Pibworth Manor (the marriage itself took at place at Shiplake). The large tomb inside the railing near the Church is that of her grandparents and uncle and aunt. His affection for the village was shown when he took his title Lord Tennyson of Freshwood and Aldworth, and the house he built near Hindhead he also named after our village. On the 2nd of January 1976 the old Yew tree, estimated by current methods to be at least 1000 years old, was uprooted in a storm. The “Old Yew, which graspest at the stones” probably inspired Tennyson’s line in his poem, In Memoriam. Part of the old root still survives and has produced new growth. Those from the village who gave their lives in the two World Wars are remembered in the east window and on the Memorial on the outside wall. Margaret Watson, one of the ten children of the Reverend A.L. Watson, vicar 1918-1936, constructed the charming Nativity reredos below the east window. She lived in the Victorian vicarage which, like the Church School closed in 1961, had to be sold. Mention should be made of the Norman ‘flower-pot’ font. These are fairly common in Berkshire and the design was probably copied from the Jewish stone jars used for ritual washing in the time of Jesus, and referred to in the Gospel of St John at the wedding in Cana of Galilee. Today a similar jar can be seen in the Orthodox Church in Cana. In 1984 the outside of the church was completely renovated. The work involved removing the defective cement screeding and re-pointing the flint work. Newbury District Council agreed to carry out the work under a Manpower Services Commission scheme. The work was finished in 1985. Further renovations were undertaken in 1991 and 1992. Money was donated anonymously, by parishioners and local businesses and Trusts, with grants from the Royal County of Berkshire Churches Trust, Historic Churches Preservation Trust, Newbury District Council and the Oxford Diocesan Board. 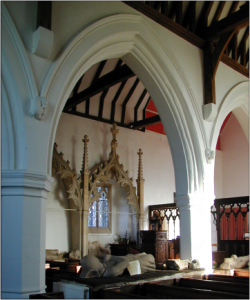 With fund raising events and the generosity of so many it was possible to re-tile the two main church roofs, the lychgate and the coffin house, and to carry out repairs to the outside of the church and windows and to re-plaster defective plaster and decorate the inside of the church. 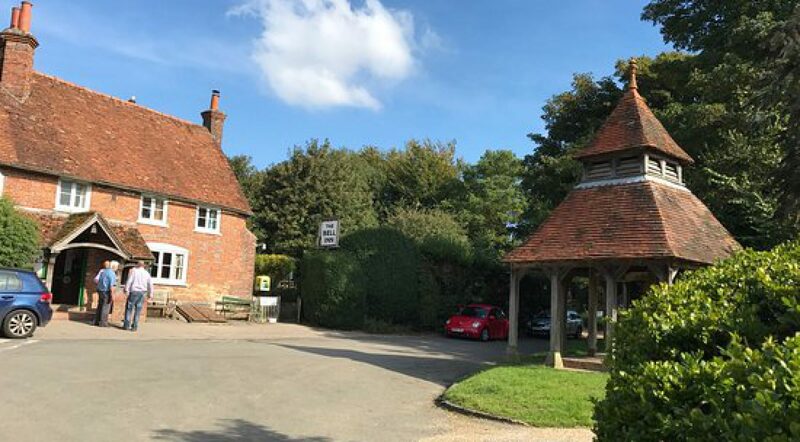 200 yards north of the lychgate is the village centre with the old School, the Bell Inn and the Well, which being 372 feet, is one of the deepest in England. We have it on good authority that a Victorian owner of the Bell Inn, a devout lady, refused to serve her customers until she had read to them from the Bible.